Reader Judy is having some trouble figuring out what an X-chromosome match means at the third-party DNA website Gedmatch.com. Welcome to the wonderful world of DNA, also known as the “we’re still figuring things out” tool of 21st century genealogy. Because we still don’t completely understand all the ins and outs of DNA inheritance, particularly what the odds are of a result like the one Judy describes here. 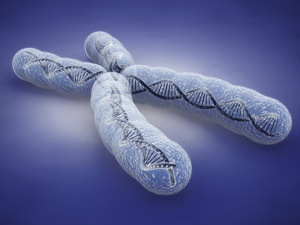 In the process of doing the autosomal DNA test, we also get information about our X-chromosome. That’s the other gender-determinative chromosome. Men have one X-chromosome, inherited from their mothers; women have two X-chromosomes, one from their mothers, one from their fathers.5 Judy’s question is about this particular type of DNA result, and her confusion comes in part from the fact that X-chromosome inheritance doesn’t behave exactly the way you might expect. We tend to think that whenever we get a type of DNA from one parent (the way a man gets his YDNA from his father or the way we all get mtDNA from our mothers), the DNA won’t change very much from generation to generation. And YDNA and mtDNA do behave that way: there are relatively few changes from generation to generation. And we understand that when we get DNA from both parents (the way we inherit autosomal DNA), it changes a lot from generation to generation because of recombination. But the X-chromosome inheritance is different. It doesn’t work exactly like any of the other DNA types at all. A woman gets two X chromosomes, one from her mother that’s the same type of random mix that her brother got (meaning she won’t match her brother exactly on that chromosome either) — and one from her father. And since her father doesn’t have another X chromosome for his X to recombine with when he passes it on, what he gives to his daughter is exactly the same X he got from his mother. And that’s where the random mixing took place: at his mother’s level. And what that means is that the whole pattern is different from other DNA types: who we inherited the X-DNA from and how it’s randomly mixed. Which affects who we match. And as more and more of us see more and more results on the X-chromosome side, we’re also seeing that sometimes we don’t get as much of that random jumbling — the recombination — in the X-chromosome as we’re used to seeing in the autosomes.6 And that may very well be the explanation for what Judy’s seeing here: one brother with a very big match to another person in the X-chromosome, and the other with no shared X-DNA at all. Because what Judy’s seeing here is one very big segment from one maternal grandparent’s line that one brother inherited — and the other brother didn’t. Looking back at the first image above, you can see that it’s entirely possible for one brother to share a very big segment of X-DNA with a match — and for the other brother not to share any X-DNA with that match at all. The takeaway here on this issue: just because both men inherit from one parent doesn’t mean you can expect they’ll both match a third person — or even each other very much — on the X-chromosome. It’s a different beastie. But what about that second question — how do we know when a match is worth investigating? The more segments you share, and the larger the segments, the more likely you and a match share a common ancestor. The fact that only one brother has the match and not the other could push it back in time to a point where the common ancestor may be hard to identify. But still, combining an autosomal segment larger than 11 cM and a huge X-DNA segment from the one brother, that match is likely to be worth investigating. And, really, what do we have to lose other than some time spent pursuing a genealogical question? Judy I have seen a lot of confusion out there, especially since FF added the X to the analysis. I think people just got to grips with idea Y is down one line and mt is down another. The idea you and your brother can have opposite X chromosomes just throws people. Esepcially when you note that due to recombination they might actually share a few bits of X even if they did start with the opposite ones. Of course the more people that test the more matches we will all get and the simpler it will be to work out whats going on. You’re so right, Adam — and we can hope that it gets a bit less confusing as time goes on. Perhaps part of the confusion is that an X chromosome is not the same thing as mtDNA. Or, to say it another way, mtDNA is not found in the X-chromosome, which is where most people assume it IS located. But either way you say it, yes, that’s undoubtedly part of the issue. My understanding is that the only purpose of mtDNA in the first place is to direct the flow of oxygen in cells. A vital purpose to be sure. However, since the egg already has mtDNA, it rejects the mtDNA in the sperm cell and thus this is the reason mtDNA is passed down through the mother. I think that’s about right. P.S. Which is nothing to with the X chromosome, or as you say, “another beastie” altogether. It’s a tiny bit more complicated than that. The entire sperm and it’s mitochondria are completely taken into the egg. However, while the sperm nucleus and DNA are merged with the egg nucleus, the egg sequesters and “digests” the remaining sperm components, including the sperm mitochondria. This is done because sperm mitochondria have a high mutation rate and it’s evolutionarily more effective to just use mom’s. There are a few diseases associated with failure to degrade paternal mitochondria. Hi, I just reread this article about the X. I had been confused and did not realize that when a woman receives X from her mother, that X is a mix of both the mothers parents X. My second cousin on my mother paternal side matches me on the X. We are both female (2nd cousins) our mothers were first cousins and our grandfathers were brothers. I had thought that I would not share X with my 2nd cousin because the great grandmothers X would have been lost. This is my match with her. So would I determine that on each of these locations, the match came from our common great grandmother? Mary, the X really does pass down very differently. You’ll be able to see this best if you take a look at the graphic on Blaine Bettinger’s site, The Genetic Genealogist. You can see it by clicking on this link. You and your second cousin are in the position of the pink circle in the center. 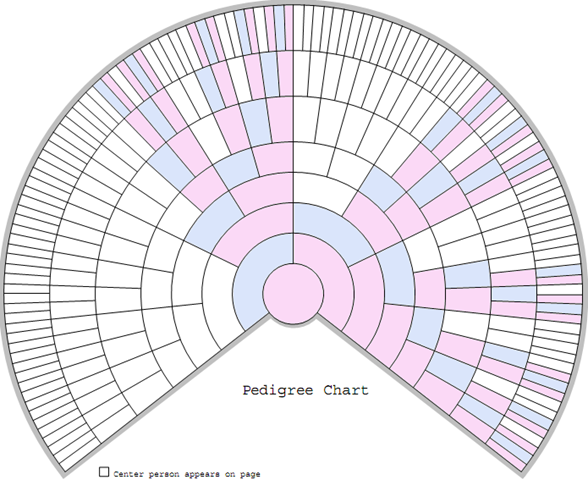 Now follow the colored boxes out to your mothers (the pink segment to the right) and then to your mothers’ fathers (both in the blue), then to their mother, your joint great grandmother. Every one of the colored segments (pink or blue) shows a person who COULD have contributed to your joint X-DNA. So as long as you’re sure you don’t share any other ancestors within those colored segments (and you’ll want to fill in the names to be sure), then yes those segments come from your shared great grandmother. You would do the same to see what common X-DNA you might share with your first cousin once removed (your mother’s maternal first cousin). on family tree dna, my alleged maternal half-niece: [her mother and I allegedly had the same mother] does not match on the X in the slightest, i.e., no matching at all, although family finder has us matching on many of the 22 chromosomes. HOW NORMAL IS THIS OR IS THIS EVEN PROBABLE OR POSSIBLE? IT TRULY BAFFLES ME AND SINCE I’VE BEEN TOLD SOMEONE ELSE MIGHT BE MY MOTHER I AM NOW MORE CONFUSED THAN EVER. WHAT WOULD YOU DO IF IT WERE YOU? The first thing I’d do is take a much closer look at the overall match information. If you can, you might want to upload both your own data and your niece’s data to GedMatch so you can see if there are X-DNA segments you and your niece have in common that are too small to be reported by FTDNA. Beyond that, remember that 50% of your X-DNA came from your father, and 50% of your niece’s X-DNA came from her father. So right away you and your niece won’t share any part of one X-chromosome’s X-DNA. As to the other X-chromosome you each have, the X-DNA you got from your mother is a blend of your mother’s parents’ X-DNA, whereas your niece’s X-DNA is a mix of her mother’s parents. So by the luck of the draw it’s certainly possible that you and your niece don’t have any big segments in common. You need to look and see whether you have NO segments in common, and I don’t think FTDNA reports that. Thanks for this article Judy, it’s really helpful. I had assumed that if I matched someone on Family Finder, but not on the X-chromosome, then our genetic link must be through the ancestors that are shaded “white” on the Blaine Bettinger charts. I think, having read your post, that this is not true, we could still be linked through the blue/pink ancestors but our shared x-DNA is too small to record. I presume from this that the only safe way to use the X-DNA match results is not to make any assumptions about who the common ancestor might be if I share no X-DNA with someone. The only time that it might be safe for me to narrow down the common ancestors is when I positively match someone for X-DNA instead. It is surprising hard to find straightforward guidance about conclusions to be drawn from the absence of an x-match. Thanks again!